17.7% gain on the Cash Flow Kingdom Income portfolio YTD, 21% on the Top Idea portfolio. Not a bad start, but some of these names have much further to go. We provide a Q1 review of the Cash Flow Kingdom Income and Top Idea portfolios, as well as a general macro update affecting these portfolios. Current thoughts on a few key names as well as expected forward returns on top ideas are provided. 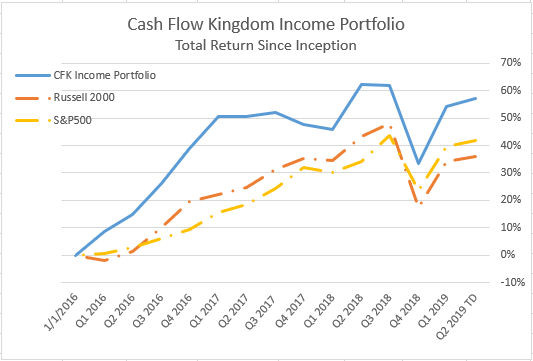 At the beginning of this year, Cash Flow Kingdom published two portfolios, indicating we planned to review them periodically throughout the year. The first was our general income portfolio published in the article titled, "11.1% Yielding Portfolio With Good Coverage And Decent Growth Prospects". The second was a mini portfolio of investments which benefited from the ongoing growth in natural gas logistics, our "Top Idea for 2019". This article is our Q1 review of these two portfolios as well as an overview of the macro situation. I would have hated to have been one of the people who bailed on the market around last Christmas (apparently there were plenty as that marked the low), and thus have missed this 2019 rebound. One thing I do behind the scenes to help prevent bailing when times are tough is to monitor a set of 4 market indicators: Yield Inversion, New Highs vs. New Lows, 200-Day Moving Average Slope, and Bullish Euphoria. The first three are probably pretty self explanatory for most of you, or you can look them up with a simple google search, the last measurement, however, may need some explaining. First, Bullish Euphoria is more of a psychological measurement than a financial one. It checks to see if the general market investor is likely to view the market positively or negatively. Understand, funds, ETFs, and people in general tend to be S&P 500 followers. So, if the S&P 500 has achieved a new high sometime over the last 99 trading sessions, investors feel good and there's pressure to stay in the market. If it hasn't, that positive pressure doesn't exist, and the natural tendency to act on whatever key fear popular media is showcasing today tends to overwhelm. By itself, this measure doesn't mean much; but in conjunction with the other three measures mentioned, it produces solid backtested results. In fact, all four of these measures have been backtested with positive results, usually improving risk vs. return if not improvement in the actual average return. Thus, when one measure is bearish, I usually do nothing (unless that one measure is a yield inversion which I tend to weight more heavily). When two are bearish, I pretty much stop buying anything positively correlated to the market (though I might still buy a bond, insurance security, or something else with little market correlation), and I let cash from dividends build. When three of these indicators are bullish, I actively look for things to sell. However, this doesn't happen often. Three of the four turning bearish is pretty rare, and has happened three times since just before the Great Recession that I can remember (including one in the Recession itself). This rarity of signals is something I consider a major benefit. A benefit which may seem counterintuitive at first, but it helps keep me in the market the vast majority of the time. You see in my experience there's always something in the market to fear. That something is usually hyped by the media who find fear a dependable way to capture attention and viewership. However, if the above indicators don't indicate I should be bearish, I personally just worry less about whatever this fear is. Thus, the mathematical and therefore logical nature of these indicators helps overcome the less rational influences which are always around us. Anecdotally, these indicators have also gotten me out of the worst of significant downturns a couple of times, including the Great Recession, but not at highs or really anything near that. Basically, they have helped shave a bit off the worst of the downturns for me while keeping me invested most of the time. This frankly is a lot better than what investors typically do, and I'm convinced better than I'd be likely to do without them. Fees. Most funds, advisory services, and ETFs are either direct or hidden market followers. Thus, since much of the money invested in the world is done through these sources, the fees they charge are a direct source of underperformance. Investors buy high and sell low. We do this not just when market movement inspires emotional responses, but also when we sell a fund or ETF for a "better one", or switch from riskier assets to less risky asset categories, or otherwise change our investment style in reflection of dissatisfaction over performance in the recent past. Regardless, when it comes to investing, I appreciate whatever crutch/aid I can find. Anything that helps me take the emotion out of investing, such as these mathematical indicators, is likely to be helpful. 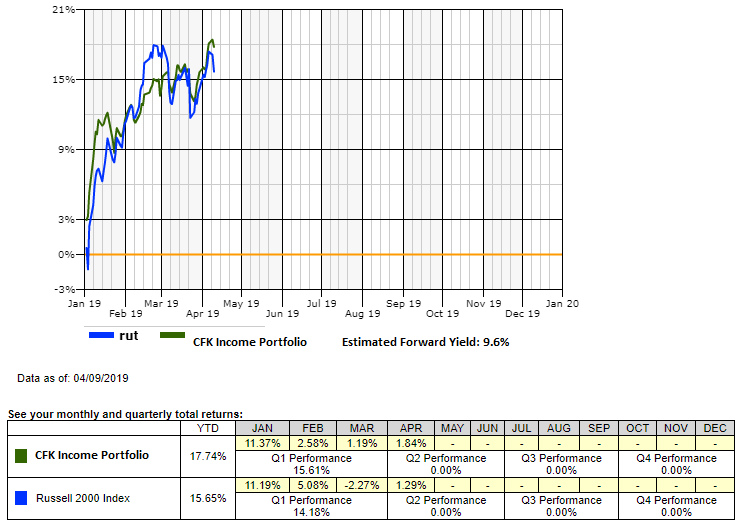 Since inception (1/1/2016), the CFK Income portfolio has enjoyed a 57.1% return vs. 36% for the Russell 2000. Most of that comes in the form of dividends. Current forward expected yield is 9.6%. Outperformance vs. benchmark is always a good sign, and over long periods of time, studies indicate dividend producing equities, particularly dividend growing equities with solid coverage, outperform non-dividend stocks. However, once again, I find the psychological effect of the yield being produced just as important. Again, the CFK Income portfolio currently enjoys a 9.6% forward dividend yield. Historically, most of its returns come from that yield. For me, the way my mind works, the relatively steady income stream this yield produces exerts a calming influence which helps me to act rationally during such times of stress. The higher yield presented during these times helps me to realize were I to sell in a panic, I'd be giving up that income stream. Indeed, to the extent I have cash from dividends available to reinvest, I sometimes see times of higher yield due to fallen prices as opportunities to "capture a raise". One of the very positive aspects of dividend focused portfolios therefore is not just a higher long-term return expectation but also the increased psychological ability to do the right thing, buying stocks when they are "on sale". The biggest loser for once wasn't Navios Maritime Partners (NMM), a very poor performer in the latter half of 2018 but relatively flat since. Hopefully, this indicates NMM has finally bottomed and might start recovering. I found the disclosure that they bought back about 2.3% of outstanding shares in this 20F filing (page 40: Equity Offerings and Issuances) comforting if not quite inspiring. NMM currently offers an 8.5% yield which was covered more than 4x by DCF last quarter, and trades for about 1/3rd NAV. At less than $1 per share, NMM seems quite cheap even as dry bulk rates are stuck in the doldrums. No, the worst performer on price over the last 30 days were J.C. Penney (JCP) bonds (KTP). This is probably because there was a $1.91 payout in March. Given J.C. Penney's very manageable debt profile up until its 2023 debt comes due, I think it likely investors will collect all payouts up to and including the March 2023 payment. Thus, by totaling those payments up, you essentially get an expected total payout. A price which if you buy below you are likely to at least get your money back from (totals $7.625 currently). If J.C. Penney continues to survive beyond that date, and thus KTP keeps paying, you win big (best reasonable case). If J.C. Penney declares bankruptcy in the latter half of 2023, you get your money back and can look to any recovery for the unsecured debt as potential upside (most likely outcome). If J.C. Penney declares bankruptcy before then, you lose (worst reasonable case). Clearly then, for KTP survival time is the main factor which will drive return. We don't need Penney to thrive, ongoing survival in one form or another is good enough. See the free blog post, "Pennies From Heaven" for more information, or the more extensive ongoing coverage available to Cash Flow Kingdom members in articles such as, "J.C. Penney Earnings Review", "A Technical Review of the CFK Buy List", and "Is J.C. Penney Really Comparable to Sears? ", as well as the ongoing comment sections of those articles and chat. One additional item of note, KTP would have made a very good dividend capture last quarter. These certificates pay 95.3¢ in interest semiannually on 3/1 & 9/1 to holders of record on dates not specified in the prospectus (2/27?). Someone who bought on 2/25 for $8.12 then sold a week later on 3/1 would not only have captured an 11.7% dividend payout, they would have also enjoyed an extra 14¢ (1.7%) in short-term capital gains for their trouble. 13.4% in a week is pretty good; however, to do that you would have had to hold through an earnings announcement (made on 2/28, you knew there would be a catch). The best income portfolio performer over the last month was perennial favorite Archrock (AROC), up 5% over the last 30 days and 9% over the last 3 months (plus a 5.4% annual dividend). Archrock makes natural gas compressors and thus benefits as higher volumes of natural gas are transported from here to there in North America. You can read more about it in, "Archrock: A DGI Darling", "My Top Ideas For 2019 ", or any one of numerous other articles I've written about it for Cash Flow Kingdom. At 98.4 for March, US Consumer Sentiment remains quite positive. The US consumer is still buying. YTD February retail sales were up 2.7% YoY. The Powell Put is In. Chairman of the Federal Reserve, Jerome Powell, gave a prepared statement which signaled not only a pause in interest rate hikes but also if necessary a halt to their balance sheet runoff. On 60 Minutes yesterday, he reiterated that policy was appropriate and he sees no hurry to change it. Thanks to the known large increase in North American LNG export plants as well as pipelines to Mexico, it is pretty clear natural gas export demand is going nowhere but up. Additionally, negotiations in the US-China Tariff War progress with the US clearly sitting in a relatively strong negotiating position. Put simply, Chinese exports to the US represent a much bigger percentage of their economy than do US exports to China. Thus, China is being much more hurt by the MAD (Mutually Assured Destruction) trade war than the US is. 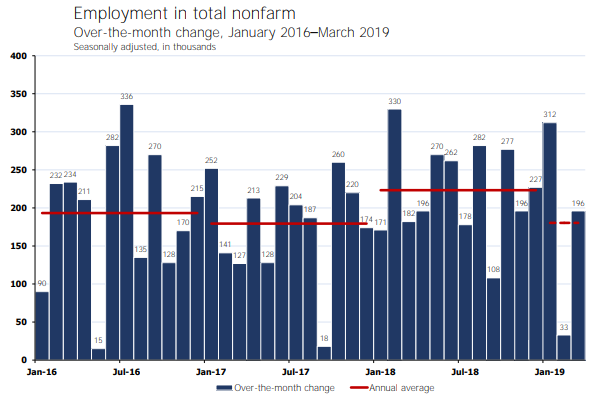 For these reasons stated above - the US economy doing well, the Powell Put, and increased probability of a satisfactory trade deal occurring - the stock market has seen a pretty decent start to the year. A rebound which could continue, particularly if a US-China trade deal is announced. LNG shipping is my favorite choice for how to take advantage of a US-China trade deal, one reason why I made it a key component of my "Top Idea for 2019", natural gas transport. However, there are also purely domestic companies such as Archrock and Energy Transfer (ET) which benefit. This NG transport portfolio is up 21% YTD, with only the admittedly highest risk member, Golar LNG (GLNG), showing a negative return (-6%). Top performers, on the other hand, have included Teekay LNG (TGP) (+41%), AROC (+34%), and GasLog preferred B GLOP.PB (+26%). "Positive Greater Tortue Project Final Investment Decision: Golar LNG Benefits"
"Dynagas Preferred Is The Lowest Risk Way I Can Think Of To Make A 10% Yield"
"Teekay LNG Preferred The Least Risky Way I Know Of To Make 9%"
Or you can consider joining Cash Flow Kingdom where we have provided multiple exclusive articles, ongoing coverage, and discussions of these names and others which benefit from secular growth in natural gas transport. 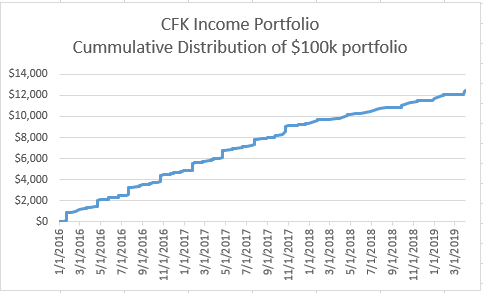 Over the last three years (inception 1/1/2016), the CFK Income Portfolio has generated a total return* of 57.1% (verse 36% for the Russell 2000). This was accomplished while also producing this very attractive, steady income stream. The primary goal of the Income Portfolio is to produce a relatively steady income stream (9.6% yield currently). By maintaining a focus on underlying cash flows, and overlaying sound money management strategy, we seek to produce a steady long-term income flow to fund retirement and/or distribution reinvestment. Cash Flow Kingdom, "The Place where Cash is King". Disclosure: I am/we are long AROC, ET, GLNG, GLOP.PB, TGP, TGP.PB, DLNG.PB, KTP, NMM. I wrote this article myself, and it expresses my own opinions. I am not receiving compensation for it (other than from Seeking Alpha). I have no business relationship with any company whose stock is mentioned in this article. Additional disclosure: This article discusses risky investments including investments tied to specific sector performance and thinly traded investments. I do not know your goals, risk tolerance, or particular situation; therefore, I cannot recommend any specific investment to you. Please do your own additional due diligence.